It maybe the pick of summer now, but in a few weeks, the cold winter weather will return and you will soon find yourself looking for different ways to keep yourself warm inside your home. As temperatures will start to decline you will most likely start to see a change in your energy bills as well. Finding out about insulation for your home as well as insulated garage door vs uninsulated from your local garage door repair Spokane company will make the difference between feeling comfortable while spending less on energy bills and feeling cold while breaking the bank. A good way to start is with learning more about proper insulated garage door vs uninsulated. Similarly to windows, a garage door is constantly subjected to opening and closing operations in the average home. However, during the winter season, you might want to avoid opening and closing the door often to avoid having the cold air in and the warmer air out. Even if your garage door will not be in use that often, conditions may still be rough without proper stream of air. With proper garage door insulation, you will not have to worry about such conditions that much while keeping you comfortable even inside of your garage. So on your next scheduled garage door maintenance, have you or the professional inspect the garage door insulation situation. While your home may use temperature control, a garage is normally excluded from benefiting of such system which will prevent you from feeling warm inside of your garage. Traditionally, garages are constructed with concrete floors and walls that do not give any thermal benefits. When you consider insulated garage door vs uninsulated, an insulated garage door will solve any concerns you may have regarding cold weather conditions insider the garage using a high R-value thermal properties to conserve any warmth that the garage may have which will prevent from warm air to exit while saving you on energy bills at the same time. As we learned this summer season, winter is not the only time of the year that offers extreme weather conditions. With 90 and 100 degree days, high temperatures can consume your home fairly quickly. When it comes to insulated garage door vs uninsulated an insulated garage door will make the difference between you getting sweaty inside your garage or stay relatively cool. Regardless of the season, a temperature controlled environment is the ideal goal for every home owner. After all, you can’t really enjoy your home or working on a project in the garage when you are hot sweating or cold freezing. You invest a lot in your home and deserve to enjoy it. 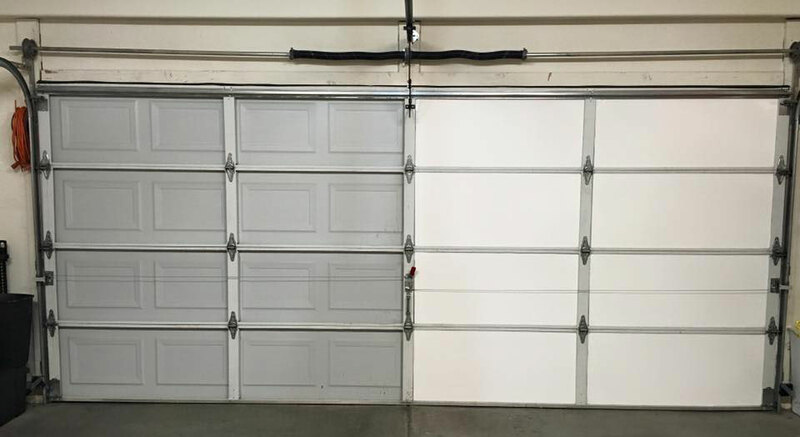 That is why when contemplating insulated garage door vs uninsulated whether if its a new garage door or old, you will come to realize that an insulated garage door will provide you that comfort. For most people a garage is not used just for storing cars or things you rarely use anymore. Similar to other rooms around your home, a garage can serve other purposes as well. From a place you can work on your projects to a small gym. A garage can be converted to just about any type of living situation. However, to make it as such, ensuring livable conditions is important which include reasonable temperature. An insulated garage door will help keep temperatures consistent regardless of the season. Whether if it’s during the summer where the A/C is being used to conserve a cool temperature or during the winter where the heater works overtime to keep all the rooms in your home warm, you can be sure the garage would be suitable for occupation during the day thanks to garage door insulation.